Though virtually unknown, the most successful Marine fighting squadron of 1945 was VMF-323, the "Death Rattlers". 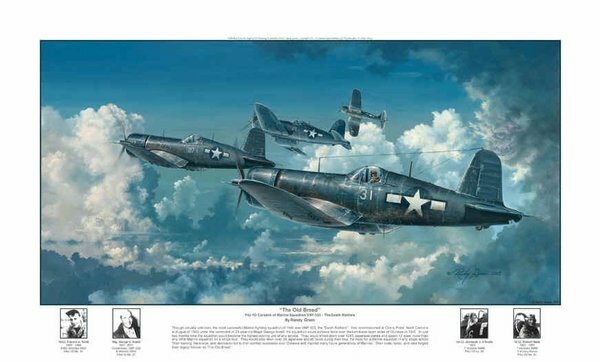 First commissioned at Cherry Point, North Carolina in August of 1943 under the command of 23-year old Major George Axtell, the squadron would achieve fame over the kamikaze-laden skies of Okinawa in 1945. In just two months time the squadron would become the highest-scoring unit of any service. They would shoot-down over 124 Japanese planes and spawn 12 aces, more than any other Marine squadron on a single tour. They would also down over 24 Japanese aircraft twice during their tour, the most for a Marine squadron in any single action. VMF-323’s training, hard-work, and dedication led to their combat successes over Okinawa and inspired future generations of Marines. Their code and valor forged their legacy forever as "The Old Breed."